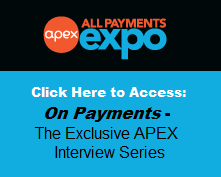 All Payments Expo Blog: 10 minutes can send you to APEX 2014 on a free pass! 10 minutes can send you to APEX 2014 on a free pass! What does compliance cost your organization? What are the risks? How does your organization navigate the regulatory environment? 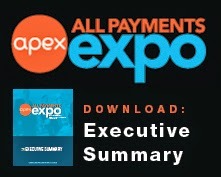 The All Payments Expo (APEX) is just around the corner March 3-5 and more than 1,500 payments pros will converge on the Las Vegas Mirage Hotel to share their expertise, hear the latest industry updates and find real solutions to their business challenges. If you've been hoping to attend, but haven't made it happen, you are in luck! The prepaid compliance experts from Card Compliant want to send you to APEX on a free conference pass, and give you access to some of the latest industry thinking and trends on regulatory, accounting and unclaimed property compliance. Simply take this short 10-question survey to be registered to win a free APEX conference pass, valued at $2,295 and obtain access to Card Compliant's exclusive compliance survey report. The survey closes Monday Feb 24, so respond now to be included in the drawing for a free pass. Respondents will receive the survey report in the few weeks following the show and can get a sneak peak during one of the APEX Immersion Lab sessions on Tuesday, March 4 at 11:30 am: Regulatory and Revenue Strategies: Maintaining a Profitable Program. Hope to see you there! Questions about the survey or regulatory compliance? Email us at info@cardcompliant.com.